Good french fries are hard to find. And if you’re an American, they can be far away too. Like Western Europe far away. Now that’s not to say that awesome pommes frites, fritten or friet cannot be found here in the States, and we do have our share of duck fat-fried potatoes populating our landscape, but when it comes it fast and easy french fry action, we are stuck with fast-food (and no, McDonald’s fries are not awesome). Belgium has three official languages (Dutch, French, and German) and with that trifecta of speech it should come as no surprise that fried potatoes are a big deal in that part of the world. So much so that they have French Fry Vending Machines. 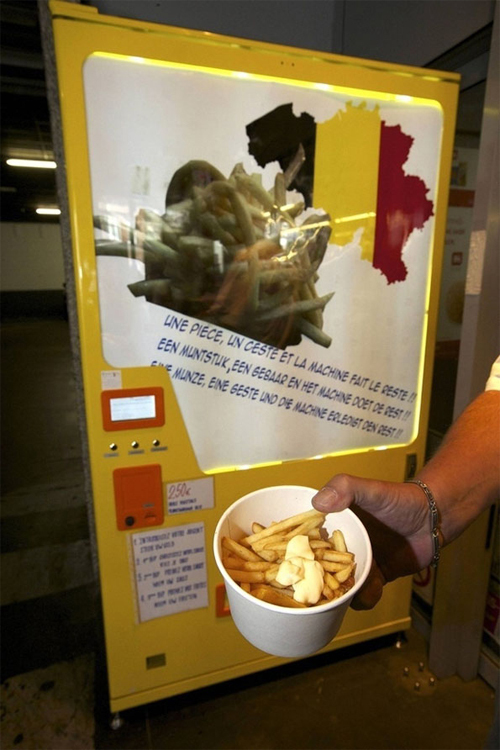 Above is shown a French Fry Vending Machine in action in Chaussee de Gand Steenweg op Gent in Brussels, Belgium. Ninety seconds to fries. Only a few bucks (€2.50). No squeaky voiced teen pretending to watch the fry basket. And yes, they are served with mayo (or ketchup). Cooking is messy business. When it is not food scraps littering the workspace, it’s spills and splashes finding a way to get on and in to everything. 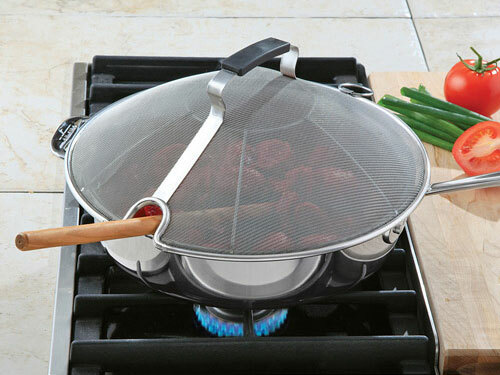 One way to keep grease from raining down on the stovetop is with the High Domed Stainless-Steel Mesh Splatter Cover. 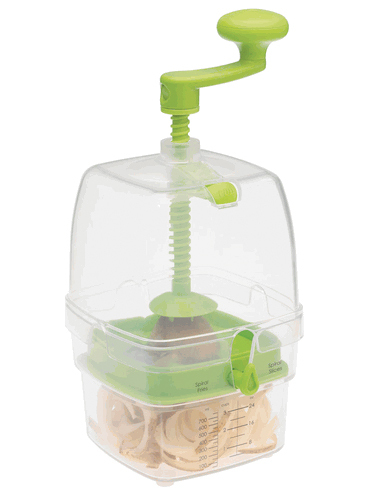 Like any splatter screen, it features a fine mesh construction, but with its high-domed nature and its convenient opening for utensils, this particular model offers expanded usability. 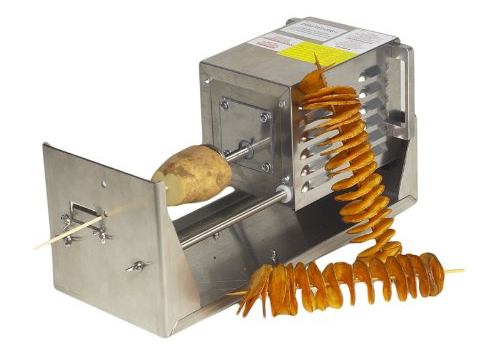 Fits 10-inch to 12-inch diameter pans. Oh, and it’s dishwasher-safe, meaning that no matter what you throw at it this cover has you, well, covered. Product link updated. BTKS has you covered! Fat may equal flavor, but that doesn’t mean there isn’t another option. Rather than suffer through bland food or questionable fat-free products, take a dip in a little bit of oil. But how to get the most flavor out of the fat without adverse heath effects? With air, of course. 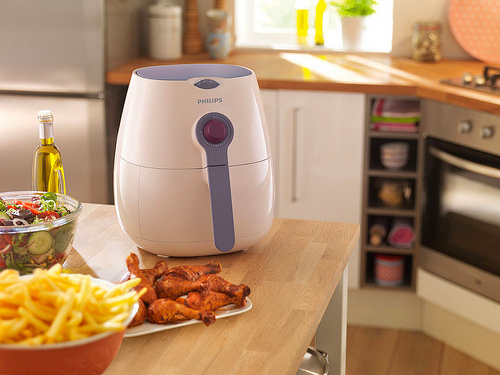 The Phillips AirFryer, introduced at IFA 2010, is an upcoming product designed to minimize fat while maximizing flavor. 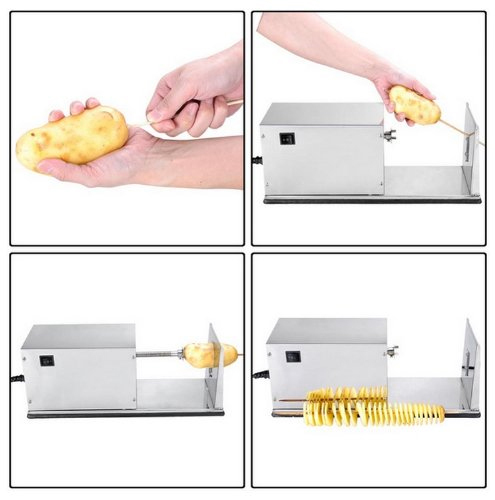 Able to create “delicious meals with up to 80% less fat”, the new kitchen appliance uses circulating air around an enclosed heating element to get the job done. When considered along with the T-fal Actifry , it’s beginning to look like low-fat fried food isn’t just a lot of hot air.